Smart Regions is not only about solving the difficult traffic problems of the provincial capital and its surrounding communities, but also about mobility in the district capitals, such as Zell am See or St. Johann in Salzburg, explained the Salzburg provincial council Mag. 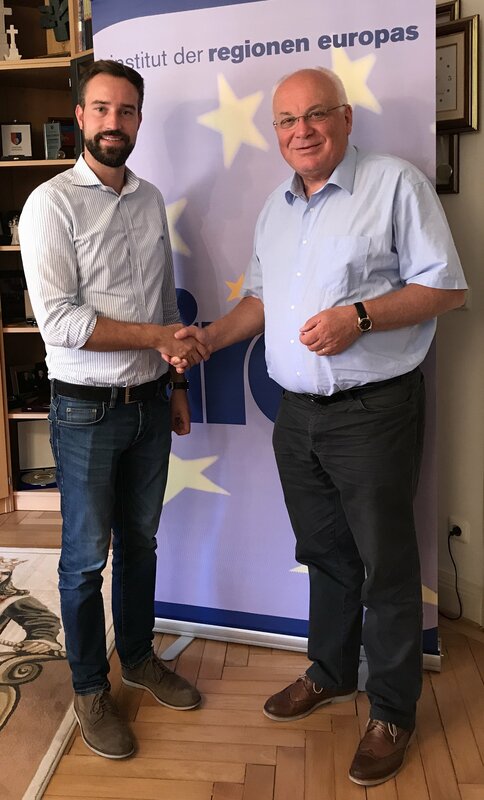 Stefan Schnöll during a working visit to the Institute of the Regions of Europe on 18th of September 2018. The government member responsible for transport and infrastructure in the Salzburg state government emphasized that in his work he relied heavily on experts and best practice examples from other European regions. He therefore highly appreciates the work of the IRE because, at its specialist conferences, it always endeavours to promote the exchange of know-how and experience among the various regions on various essential topics in the regions. IRE Chairman Franz Schausberger pointed out that it is precisely to promote the creation of good transport infrastructure and public transport to remote regions that are able to largely stem the outflow from rural peripheral areas which can be observed throughout Europe.